With crochet Irish lace tutorial you will learn how to crochet chaotic mesh in Irish Lace. 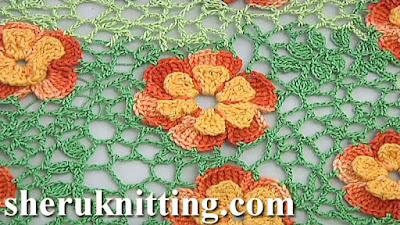 This tutorial will be hopeful for a beginner in Irish lace technique and shows you how to connect motifs with a help of a crochet mesh. While this tutorial is for beginners, you can experiment, especially as you gain experience, employ smaller finer thread; even coloured threads. For work, you need a mat, beads, crochet hook, flowers, pins, thread.